Now with Ultra-widefield (UWF) Imaging with the latest Optos Daytona! 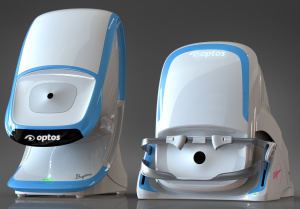 The Optos Retinal Mapping System captures a 200 degree wide image of the retina on the back of your your eye. By looking deep into your eye, our doctors can look at the Optic Nerve, the thousands of nerves branching out, the macula, and other parts of the tissue throughout. How does this help? By looking in these areas, our eye doctors can detect some of the earliest signs of the development of eye and total body diseases like glaucoma, cataracts, diabetes, melanoma, and many others. The retinal image on the left is of a healthy eye. The image on the right shows the damage of bleeding and leaking due to diabetic retinopathy. These conditions are usually treatable and reversible when diagnosed early and managed promptly and appropriately. This patient may not notice any signs, symptoms or changes in their vision. Only proper examination by their optometrist using high tech diagnostic tools will catch these changes early and allow early treatment.